Koh Chang Ferry port is around a 3.5 hour drive from Pattaya, a 45 minute ferry crossing will have you on the shores of the beautiful Island of Koh Chang, a little further than Koh Samet but with a lot more to offer. A majority of ferries operate from Laem Ngop, which has three piers . Laem Ngop (Tha Khrom Luang or Tha Laern Ngop) pier is approximately 700 metres west of Laem Ngop. The Centrepoint (Tha Centre Point) pier is located about 3.5 km north-west of Laem Ngop. These piers serve both vehicle and passenger ferries. Koh Chang vehicle ferry pier is located in Thammachat Bay (Ao Thammachat), around 15 km west of Laem Ngop. All piers on Koh Chang are situated on the east side of the island. The major piers are the two Dan Kao piers, Tha Dan Kao and Tha Ferry Dan Kao, who handles most of the traffic. Snacks, fruit and beverages are available at all the piers and on the ferries. 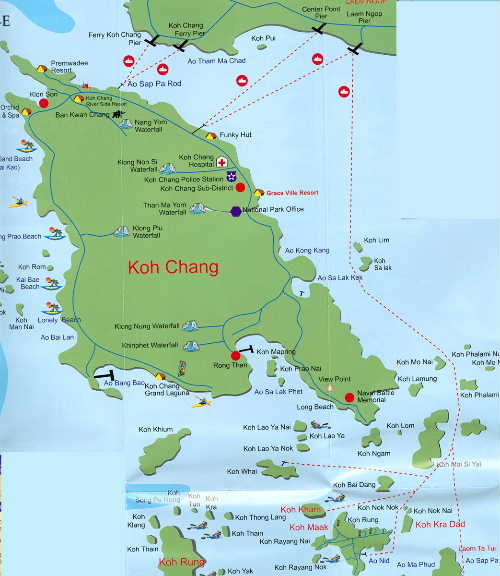 There are two operators that provide daily speedboat services from Ko Kood to Ko Chang. One is based in Bang Bao, the other on Kai Bae Beach  Rates are the same but departures times can vary, so make sure to book ahead.